Federal armies under Maj. Gen. William Tecumseh Sherman had rampaged through Georgia on their “March to the Sea,” and now were cutting a swath of destruction as they marched north from Savannah through the Carolinas. Locked in a desperate defense of Richmond and Petersburg, there was little Lee could do to stem Sherman’s tide—so he turned to Johnston. Yet Lee saw his old friend and professional rival as the only man who could stop Sherman—the only man who could achieve the impossible. “J.E. Johnston is the only officer whom I know who has the confidence of the army,” Lee told Davis. Back in command, Johnston would have to assemble a makeshift army—including the shattered remnants of the once vaunted Army of Tennessee—then somehow stop the Federal juggernaut. He would thus set out to achieve something that even had ever eluded Lee: deal a devastating blow to an isolated Union force. Success could potentially prolong the most tragic chapter in American history, adding thousands more to a list of casualties that were already unbearable to read. Emerging Civil War first previewed the book on October 29, 2014. About the Authors: Historians Daniel T. Davis and Philip S. Greenwalt, co-authors of Bloody Autumn: The Shenandoah Valley Campaign of 1864 and Hurricane from the Heavens: The Battle of Cold Harbor, now turn their considered gaze toward the long-forgotten battles of Averasboro and Bentonville. 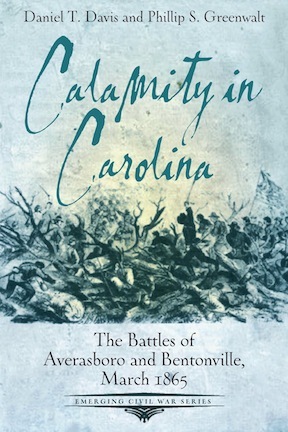 Written in the accessible style that has become the hallmark of the Emerging Civil War Series, Calamity in Carolina: The Battles of Averasboro and Bentonville includes more than a hundred illustrations, new maps, and thought-provoking analysis to tell the story of last great battles of the war in the West—which had shifted alarmingly far east.